There are two main ways that carpets are cleaned. Both methods can be used for most types of carpets, however, it is wise to understand the benefits of both methods before you choose one for your carpet. The carpet cleaning specialists at Golden Glove know how to get the most out of your carpet. We can take care of all your carpet cleaning needs, just give us a call! Golden Glove services carpet cleaning for Peachtree City and the surrounding areas. The two main ways to clean carpets are steam cleaning and chemical cleaning. In this article, we will discuss the pros and cons of steam cleaning and chemical cleaning. Steam Cleaning- This method is more technically called hot water extraction. The process is described perfectly by the technical name because pressurized hot water is sprayed on the carpet and then immediately extracted. This method is more common because it uses less harsh chemicals than chemical cleaning. A shampoo is usually applied to the carpet before it is steam cleaned. This loosens up the dirts and oils in the carpet and makes it easier to clean. This process is admired by many because it does not use any harsh chemicals. This method, however, does leave the carpet wet for a few hours. Chemical Cleaning- Some people prefer this method over steam cleaning because it leaves the carpet dry right after treatment. For this reason, many industrial settings and retail stores use chemical cleaning because there is not a waiting period after the carpet is cleaned. The chemicals used in chemical cleaning can be very harsh and leave a harsh scent. For this reason, many homes with pets and children may prefer steam cleaning over chemical cleaning. Chemical cleaning uses a powder that is sprinkled over the carpet. After the chemical powder has cleaned the carpet, the excess powder is vacuumed up. The problem with this is if not all the powder is vacuumed up, it can begin to show white residue on the carpet and on clothing and shoes. Whether you choose chemical cleaning or steam cleaning, be sure to talk with the professional that will be treating your carpet. 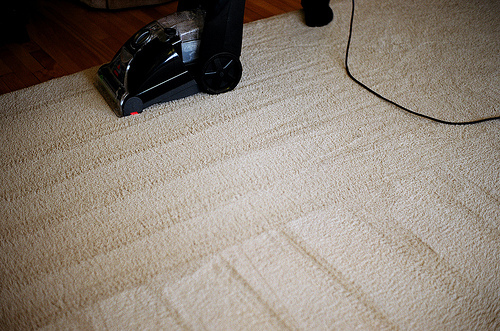 Good communication with your carpet cleaner will help you avoid unwanted results and add-ons that they might require.